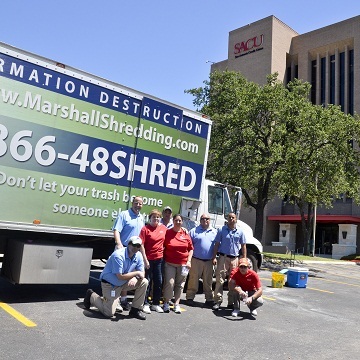 Shred Day volunteers complete 10 years of successful shredding at SACU’s Corporate Office on IH-10 West near Vance-Jackson. The $2.9 billion San Antonio Federal Credit Union and ARMA, an association of records professionals, helped shred 68 tons, or 136,000 pounds, of documents this year, the 10th year the Texas credit union has sponsored Shred Day after Tax Day. This year’s event also garnered $3,000 in donations. The event is intended to both help the environment and protect members’ identities.